This is the full, compiled package of Zur/Column5's FJ-3M Fury. I've assembled all theskin/decal sets I could find into one big lump. Also included is a new drop tank (based off the original Sabre tank), as reskinned by C5 for the original release. I've just did some hex editing and renaming of the tank to create the "new" version just for the Fury. Other changes are the addition of the Userlist, a new avionics ini that adds the radar-ranging gunsight. And a revamped SF2 version of my 'artwork' hangar screen. Loadouts use all stock, in-game items. The aircraft is fully carrier-capable, via the addition of a 'virtual' arrestor hook. The 'destroyed model' callout has been added, using the closest shape (F-100D). Not perfect, but it works! As always, READ the enclosed readme for full,detailed, easy-to-follow install instructions. Of course, the usual 'Notes' section for the ravings of a madman!! Converted Command Wing emblems to lo-viz as pointed out by daddyairplanes - Thanks! Copy the contents of the uncompressed "To_Mod_Folder" folder into your Saved Game mod folder. Overwrite any conflicts... Enjoy! ------------------------------------------------------------- SF2 USAF/NATO/Western Cargo Planes by Veltro2K 3/20/2013 -For SF2, Any and All- This is a re-release of these aircraft, as some have stated a desire to have them again. This pak includes all my reskins, decals, ini tweeks from the various "upgrade paks" I'd released before the aircraft were disappeared. G-222 Spartan (called such in USAF service) Some may be more complete than others, with regards to decals and such. Some are fairly 'untouched', and will need further decaling, etc. Some hangar and loading screens are NOT in SF2 format, and will need redoing (meaning: I never got around to them!). All the original readmes from the Upgrade Paks (I could find!) are included within this main folder. I'd reccomend reading them, just for fun! Skin and some decal templates (again, when I could find them!) are included. The decal template is for the "ttag" decal, that is for USAF AMC usage. This pak is quite large, as the skins remain in their bmp format. You can convert to jpg at you convience. As always, fairly easy to follow, yet detailed install instructions are included. PLEASE read them!!! PLEASE read the "Notes" section for other important notations. Also, the Legal Statement has been changed with regards to this aircraft. For those that still have the original releases, you may not need to reapply this package. But, to be safe, PLEASE check over your aircraft to be sure. Thank You :). **These aircraft herein are released in "AS IS" Condition. There are/may be some issues with the LOD that may not/cannot be resolved. Period. Any and all issues/problems that cannot be solved via ini edits will exist forever, as new models are unlikely to be created. For now. ** ------------------------------------------------ =TO INSTALL: As I always reccomend, unzip the "sf2_veltro2k_cargoplanes_pak.zip" to a temp folder or your desktop or somewhere else that's easy to find Then, simply, copy/paste the Objects folder supplied directly =OVER= your existing /Objects folder. Notes: Again, as these are considered "heavies", they are best left under AI control, even though they all have cockpits. What can be done with them, I've not too many clues...however, with the SF2 mission builder, they can be inserted into campaigns, single missions and a host of other opportunities that present themselves. Use you imagination. If there is a HUGE hugh and cry, perhaps I can be moved to locate all the Soviet transports Veltro did....if I can find where I put them! If you have any problems, questions, comments, I can be reached in the usual places; CombatAce, SimHQ, or via the email addy below. Happy Hunting! This is freeware, with limited/controled re-release; it CANNOT be redistrubuted, or posted on other sites even if the original readmes and all other pieces of the package remain intact. All aircraft have had their data inis reworked to correct, add, move, remove or generally "fix" all the hit boxes, relocate components (ie: fuel tanks, as best as possible inside the airframe) and in general clean up many things that simply escaped notice. The exception here is the Pan Am 747, which gets a partly repainted skin, with all new 100% accurate civil registration number decals (18) AND their matching "Clipper" names. Decal Randomization is "TRUE". The 747 and DC-8s also get an avionics upgrade (GM radar). Some sounds are included; you may have them alread, or not; but I like "to be sure". Please note, some of these aircraft may NOT be in the SF2 downloads section; one will need to Search the SF1/Wo* (1stGen) downloads. Equally important, is to HAVE the aircraft installed =BEFORE= installing this Upgrade Pack. Kinda makes sense, right? <gr> As is always reccomended, unzip to a temp folder or your desktop to give easy access to the rest of this readme for it's install instructions. Happy Landings! Me, for taking on the job. Other Notes and Nonsense: Included are the original Data inis, already backed up, in case you End Users (tm) don't appriciate all the hard work that goes into creating, giving, and keeping up the Mods we do. Remember, these mostly exist for "Eye Candy" and Targets (tm), but I felt it was well worth the effort to try and correct the hit boxes. Also, remember they're really not to be Player Usable, even with cockpit, as the Game Engine has no coding for their proper usage. But, have fun anyway! A note about the destroyed model usage: While not 100%, we work with what we have, after all, it's just a burning, dead wreck on the ground. If a 3d Modeler (tm) wants to build crashed birds; go for it, I says! I know the "Clipper **" name decals are in the wrong font, but after spending an hour and half trying to FIND the correct one, just chose to use one of my script fonts. Deal with it <g>. At present, there are NO plans whatsoever to update the individual aircraft packages. End Users are on their own to locate the aircraft in the CombatAce downloads sections and apply this fix-it pack. --------------------------- If you have any problems, questions, comments, I can be reached in the usual places; CombatAce, SimHQ, or p0rn sites. Happy Hunting! This is freeware, it =CAN= be redistrubuted, or but =NOT= posted on other sites even if the original readmes and all other pieces of the package remain intact. This package may =NOT= in any way, shape or form be used in any payware additions. ------------------------------------------------------------- B-58A "Hustler" 7/8/2011 -- For SF2, Any and All -- This is a modification of Pasko's B-58 Hustler, to bring it more in line with SF2 standards. An extensivelly modified F-4 Phantom pit (stock 3W ini only -as the cockpit exists in all versions of the game). This one makes use of many 'moves' to drop items out if sight, and uses the physical external model for the windshield framing. This WILL cause the game to lockup/freeze for some reason, and the only way out is C/A/D to start the Task Manager and kill it that way. You, however, can drop your tank, exposing the multi-megation bomb, This is how it would have been delivered ... the tank was kept until the bomb run, jettisoned, and then the bomb dropped. Apparently, when Wingmen are given the 'attack my target' order, they should automatically dump the externals. (Unfortunately, during STIKE mission testing, it seems that giving your wingman ANY orders like - 'attack my target' may also freeze the game. Don't know what's causing it. Something releated to the nukes/TCP maybe??? Just be advised ... and let the AI handle ALL of these aircraft). They're quite fun for high-mach, low level flying. This is freeware; it CAN be distrubuted, as long as this readme and all pieces of the package remain intact. Older Skins available at CA are not compatible with this mod!!! This is modified ErikGen model uploaded on CA by Wrench on April 12th 2014. Some time ago I decided to rework this pretty aircraft. So, first of all, thank you Enrico. I changed mapping a bit, did some ini dance, only left the fletcher tank selectable, organiezed folders new and made new skins. This is a mod of Veltro2k's C-97G Stratofreighter depicting those as used by the Israeli Defense Force/Air Force in the mid-1960s through the late 1970s. 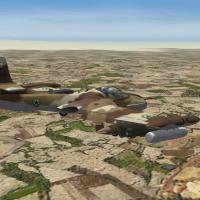 This is the full aircraft "nationalized" for IDF/AF usage only. Serial numbers are 100% historical for aicraft(s) depicted (both B337 & C-97). All markings are decals, and decal randomization is TRUE. Pilot figures, various sounds are supplied. The new, updated/upgraded template IS included for other skinners to use. As always, fairly easy to follow, detailed install instructions are included. So, please READ them ... after unzipping but before installling, of course!! The SF2 date switch is used on the skins for the C-97, switching from MATS to MAC in 1961. Serial numbers, while generic in nature, ARE for the model depicted (KC-97G). 18 serial decals are included. Decal randomization is true. All markings are decals (excepting the HC-97's wing tips). Damage texture is in DDS. A template is included in a seperate folder, but was only partly redone for those areas I need to repaint. Skinners are encouraged to improve and expand on it. In the C-97's decals folder, you'll also find the psd to create the "nose lozenge" that carried the last 4 digits of the serial number. 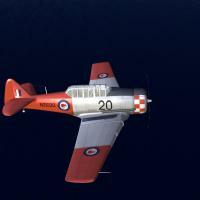 This style is/was used on a great number of other MATS/MAC aircraft. Crew entry door is operated by the Standard Animation Keystroke �, Shift/0 (zero). The rear cargo door & Loading ramps are operated by the standard bomb bay keystroke (Control/o (oh). The Northrop Grumman E-2 Hawkeye is an American all-weather, carrier-capable tactical airborne early warning (AEW) aircraft. for the United States Navy as a replacement for the earlier, piston-engined E-1 Tracer, which was rapidly becoming obsolete. and radio communications due to advances in electronic integrated circuits and other electronics. The fourth major version of the Hawkeye is the E-2D, which first flew in 2007.
production run of any carrier-based aircraft. The E-2 also received the nickname "Super Fudd" because it replaced the E-1 Tracer "Willy Fudd". have been sold to the armed forces of Egypt, France, Israel, Japan, Mexico, Singapore and Taiwan. You fill find the complete aircraft in this package. All decals are made by me. I redraw the panel lines and rivets. Serials are real one's but not squadron specific. The Canadian version of the Lockheed Neptune (P2V7) served as an anti-submarine, anti-shipping and maritime reconnaissance aircraft in the RCAF Maritime Air Command from 1955, replacing the Avro Lancaster maritime aircraft. The Canadian P2V7 was fitted with piston engines initially, although, in 1959, the Neptunes had two underwing Westinghouse J34 jet engine pods retrofitted, similar to those fitted to US Navy variants. Armament included two torpedoes, mines, depth charges, bombs carried internally plus unguided rockets mounted externally underwing. A total of 25 Neptunes served with nos. 404, 405 and 407 squadrons until 1960. Upon unification of the Canadian Forces in 1968, the Neptune was retired and retroactively re-designated the CP122, The RCAF Neptune was replaced by the Canadair CP-107 Argus in the same year. To be used on Florian CP-140 ONLY. These skins represent the Hi-Viz and Low-Viz schemes used by the RCAF on their CP-140's Aurora. The serial numbers in this skin pack along with planes numbers fit per the squadrons they are (or been) with. Some minor details might be different then real life CP-140 as i have not been able to change this as they were model related or decal would not show up properly. 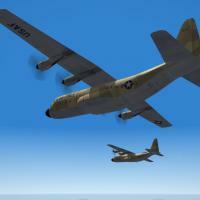 Copy the FOLDERS of the current pack objects/aircraft folder in your game CP-140 aircraft folder. 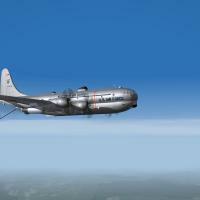 Copy the FOLDERS of the current pack decal folder in your game CP-140 decals folder. 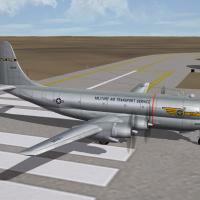 Copy these 2 files : CP-140_Loading & CP-140_Hangar from this pack objects/aircraft folder to your game CP-140 folder. Copy the CP-140 aircraft folder content to your game aircraft folder. 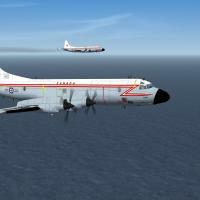 Copy the CP-140 decals folder content to your game decals folder. Thanks to Florian for providing the wonderful complete CP-140 and the template i used to create these skins. 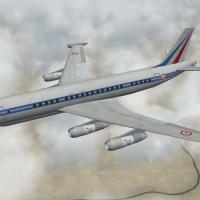 Simple mod of Veltro's DC-8 aircraft. Ive made this to fill my Desert Storm instal. It is not perfect but consider this as beta. If someone wishes to add something, improve skins etc...contact me. Fake Pilot mod is needed to run this mod. I've made one basic skin thanks to templates from original pack and DC-8 Sarigue mod. I'm using C-160 pit from florians work. It fits well for me here. In case i want to fly this. This mod features three versions of the Douglas DC-8 jetliner and historical skinsets from introduction in the early '60s through the mid '80s. A little something for eye candy around the airfields or to run intercepts on. *DC-8-60 representing two of the final new build versions with stretched fuselage. Includes USAF, RAF, RAAF, ROKAF, JASDF, IDF, PAF, VNAF, EAF and IRIAF C-130 Hercules - Models A, B, E, H, J, K and KC-130! Special Thanks to Yakarov79! Thanks for the additions! !! First and always - BACKUP! ** Copy the contents of the uncompressed "To_Mod_Folder" folder into your Saved Game mod folder. Overwrite any conflicts. Firstly, I did very little to create this pack. I just polished and reset the gems I found. All credit goes to the people who came before me to create the excellent packs on CA. There is a long list of credits in the original "ReadMe" files in the "Extra" folder...but here is a brief list of acknowledgements! depending on the model and operating air force. - Wrench: a lot of previous precious work included and upgraded here. Great Kev! This little bird will fit with almost ALL our existing and future cold war scenarios. Included are decals, new J85 sound, an updated squadronlist.ini, appropriate weapons, and 3 versions of the aircraft. -Lod is locked in, unless Centurion-1 returns. -Modders: there is a bleed issue on the right side. any bands like the VNAF had need to be on skin, not tga. small decals like insignia work fine. 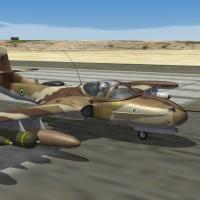 -This mod uses my master squadronlist.ini. IF installed into another install with other than stock squadronlist, do not install. It will mess up the other things on your install and my mod is adapted to force the decals. in house and therefore free. DON'T FORGET TO BACK UP BEFORE INSTALLING! If you install this in a install that has eburgers SF2V Air & Ground Expansion Pack, DO NOT INSTALL THE PILOTDATA FOLDER!!!! This will overwrite the Squadronlist.ini in the pack and may break something. If you do not have the Air&Ground pack or NATO Fighters installed the new squadronlist ini will work fine and be a big improvement for units available. Engine sound: (F80Engine)currently unknown, if this was you let me know so I can give you proper credit. J85-2 sound added by Eole. this bad boy. Matt, I hope you're doing ok wherever and whatever you're upto. I hope you enjoy this mod folks! this is and update to the FM and sounds by Eole, as well as a F80 sound which was referenced by a former Tweet driver as accurate. 3 sounds to chose from, just open the data.ini, uncomment ( delete //) the sound you want but be sure the two you dont want are commented. 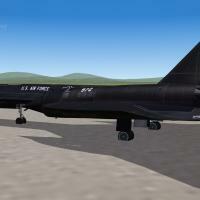 THE SR-71A UPGRADE PACK 2.0 for TW’s SF-2 series sims. The first splits the the Blackbird’s life from the beginning to early 80’s,thesecond from 1982 to the end of it’s career in 1997-98 including late 90’s airframes reactivations. This was made to let you use the respective style numbers and markings (early whites and late reds) and for the crews that can wear both early white and late pale orange David Clark S-1030 suits. Also included in SR-71A Early are Nam Kadena’s Habus (ICHI BAN,RAPID RABBIT,ROSEMARY’S BABY SAN,CHARLIE'S PROBLEM) made for your SF-2V and SF-2VXP Pack installs. X-RAY for plane,pit and pilots skins,decals,and to let this upgrade reach the light! [2.1 V] : Charlie's Problem (missing texture) solved. Thanks Geary for report. 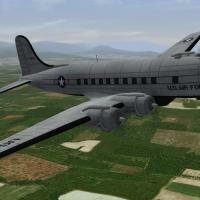 This mod represents Big Safari modified C-54D for recon flight under code name Hilo Hattie. Modifications included installation of a new night photography capability with photo flash cartridge ejector and Reconflex VI infrared camera. C-54D 43-17235 began operations on 20 April 1962 with a cover story for aircraft's purpose. Hilo Hattie mapped all of south Vietnam and border areas of Laos and Cambodia. During 10 months of service, the aircraft flew 102 missions before it was replaced by Brave Bull - Big Safari modified C-97G. So this mod is mostly for players interested in Wings Over Vietnam. Decals, skins (based on veltro2k templates) - yakarov. Hilo Hattie ini work (few lines for fake pilot and weaponstations work) - yakarov. Fake pilot mod is done by me - yakarov. 'The History of Big Safari' Colonel Bill Grimes. This the release of the Veltro2k's WW2 & Post-War US Cargo aircraft, made most famous by it's use during the Berlin Airlift. It is REQUIRED that you have some measure of SF2, merged to whatever level, as this mod references the stock An-12's destroyed model. Hence, the need (as I state it always) for a Full 5 Merged install. It is usable without, but you may not have the dead, burning wreckage on the ground. It has NOT been tested in 1stGen SF/Wo* at any patch level. It most likely will =NOT= work, due to LOD coding. "USAF", Natural Metal, post 0ctober 1947 (tagged with Military Air Transport badges star-bar w/red stripe). The AvHistory engine is included. Skins are in jpg format, and decal radomization is set to TRUE for all. ALL markings are decals. The damage textures are in DDS format. The template is included for other skinners (and in the hopes someone can clean up the mess I made of it!! Each skin has it's own Hangar Screen, matching the paint job (more or less). The cargo loading door/ramp opens and closes with the standard Bombay key (Control/0). As always, fairly easy to follow, yet detailed install instructions are included. PLEASE read them!!! Also, give the "Notes" section a read, in particular on operational usage, and the FM and other stuff like that there. 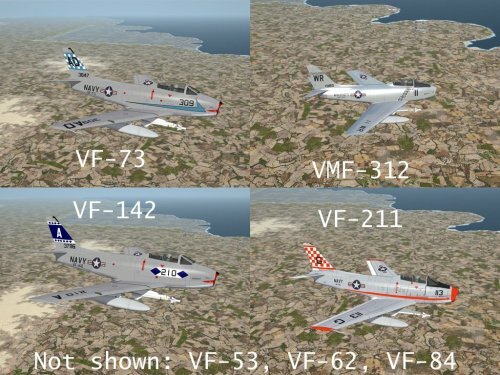 This package includes the full set of F-89 Scorpions, from MontyCZ's original C & D version, PLUS the variant mods I'd created, giving the H, J (Early) and J (Late). The various readmes for the sub-variants are included in their specific aircraft folder, just for historical purposes. This package has been peaked and tweeked for use in SF2 =ONLY=, and is NOT designed for use on SF/Wo* series 1st Gen sims. It makes use of certain elements found ONLY, and usable ONLY, in SF2. Everything is included -aircraft, inis, skins, decals, weapons, pilots. =EXCEPT= a cockpit. Due to changes in SF2's internal coding, these aircraft now make use of the stock in-game F-4B via ini edits that through sorcery now reach back into the cat files, and create usable cockpits without the need of a cockpit folder. How this works, I don't know or care; but that it =does= is a wonderful thing!! On such aircraft that have operating canopies (those that use the F-89D lod), the canopy works via the Standard Manual Animation Keystroke , shift/0. This package is designed to REPLACE the original set, and will drop right over it, providing you have it already. If you don't, no worries! Just install as normal. As always the standard, fairly easy to follow, yet detailed install instructions are included. Please READ them! The KC-97 Stratofreighter was an aerial refueling tanker variant of the C-97 Stratofreighter (which was itself based on the Boeing B-29 Superfortress), greatly modified with all the necessary tanks, plumbing, and "flying boom." The cavernous upper deck was capable of accommodating oversize cargo accessed through a very large right-side door. In addition, transferrable jet fuel was contained in tanks on the lower deck (G-L models). Both decks were heated and pressurized for high altitude operations. Serial numbers, while generic in nature, ARE for the model depicted (KC-97G converted to L model). 18 serial decals are included. Decal randomization is true. All markings are decals. Damage texture is in DDS. Crew entry door is operated by the Standard Animation Keystroke , Shift/0 (zero). The standard bomb bay keystorke, Cntl/0 (oh) operates the refueling boom. For skinners, within the Decals folder is a PSD to assist in the creation of other USAF ANG tail badges, as well as some base bmps for other decals to be made from. A new combo "jet/recip" engine sound (borrowed from the P-2H Neptune) is included, as is the usual "4 engine piston" for those that find the other too loud. serial numbers, while generic in nature, ARE for the model depicted (KC-97G). Decal randomization is true. All markings are decals. End Service Year is 'best guess' (and longer than historical), but will cover until/if KC-97L is built and released. 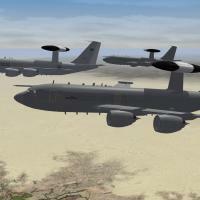 This mod upgrades Veltro2k's C-17 Globemaster III to incorporate all tactical USAF and all foreign users. It has skins for all 9 C-17 operators as well as time specific in the USAF and a couple of fictional skins (15 in all). The base skin has been updated by Flogger23 and myself, and ini updated by yours truly. unzip, copy to mods folder, allow overwrite if needed. -while cargo statements are included in the data.ini, there is a wall at the back of the cargo bay that prevents the interior from being seen. If this is remodeled, i will include cargo "weapons" and tweek the positions. -the Qatar VIP skin does not have "Qatar" decal on the bottom. It left a mark on the right side as a tga and was too screwy looking being on the seam of the skin so i left it off. I hope you enjoy this mod and airlift the troops right to the enemies doorstep. Presenting ... The DC-10-30 Airliner! 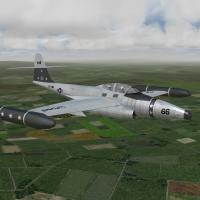 This bird is created from Marcfighters KC-10 model and some ini editing by yours truly to remove the AAR equipment. in this version the aircraft is shown as many airlines flew her in the 1970s, 1980s and 1990s. This supersedes the previous version. down on gear and flap retractions and the non moving control surfaces. create a new skin based airline for it. the airlines are on as tga so that many airlines show up at one time. This mod adjusts Veltro2k's E-3D release to add all 3 E-3 versions that used CFM-56 engines. Included are the RAF's D model, French AF's F model and Royal Saudi AF's A model. No there is not an ESM kit for the E-3F at this time. If a 3d modeller is able to assist in the future one may be added via fakepilot. However the French birds are the only ones to use that bit of equipment, so it is somewhat low priority. I hope you enjoy this humble little mod.